Do Catholic Principals think parents are stupid? 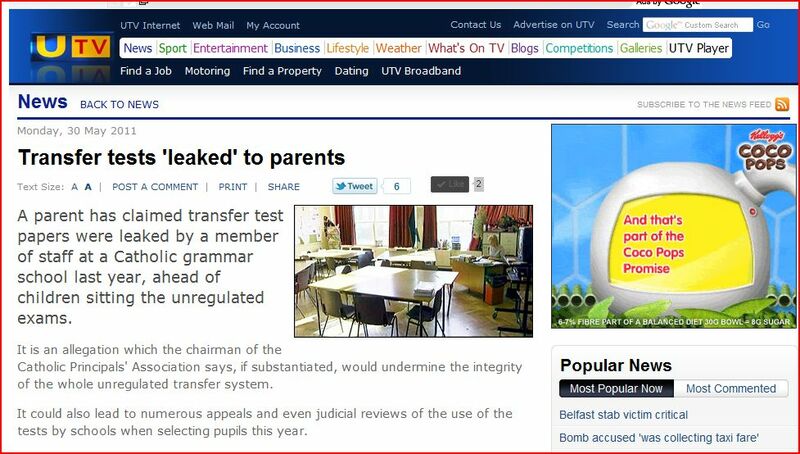 The timing of this story (found only on the UTV internet site) is typical of the multiple cynical attempts to manipulate and stress parents by those opposed to academic selection. Did it really take a year to discover what many insiders knew last year about the validity and reliability of the GL Assessment Tests commissioned by the PPTC? PACE has highlighted the lack of a specification for the GL Assessment test. Perhaps Mr Ronnie Hazzard of the PPTC will rush to deny this assertion by his friends in the Catholic Principals group? Whatever happened to Concerned Parents for Education? The Minister for Education’s confirmation last week that entry to grammar school will only be on the basis of an academic test raises renewed questions about the continued use of the CCEA Pupil Profile. The Pupil Profile became the favoured solution to the 11-plus conundrum for a number of education ministers, political parties and teachers unions. The Association of Quality Education’s heroic leader, Sir Kenneth Bloomfield, former defender of Victims throughout Northern Ireland and more significantly former Head of the Civil Service wrote articles in the Belfast Telegraph extoling its value. Robust and valid were the frequent adjectives most inappropriately employed by the sanguine wordsmith. Now that AQE has secured a private entrance exam to its publicly funded grammar schools no further mention has been made over the mixed messages on the Pupil Profile. For Concerned Parents for Education, one of the front organisations created to provide multiple roles for headmasters and teachers a problem arises. Are they still supportive of the Pupil Profile as their preferred solution for entry into grammar schools, as were the Direct Rule ministers , Sir Kenneth Bloomfield, Roy Lilley, Marcus Patterson and Billy Young of Belfast Royal Academy or have they been suckered by these same individuals into having the views of parents misrepresented by selfish, hypocritical double speaking people only interested in making a private business out of taxpayer funded grammar schools? Since Concerned Parents for Education (CPE) told the BBC http://news.bbc.co.uk/1/hi/northern_ireland/4325025.stm that they want the pupil profile to be used for academic selection and CPE are a constituent part of AQE, parents must now see that AQE does not even have the ability to hide its true agenda. That agenda is to have the DENI fund private testing for profit to gain entry to grammar schools. Billy Young’s weak interview on BBC Radio Ulster’s morning show in which he thanked the minister for her free publicly funded advertising of his company’s arrangements is a fair example. The Council also reminds Catholic parents of the duty of entrusting their children to Catholic schools wherever and whenever it is possible and of supporting these schools to the best of their ability and of cooperating with them for the education of their children… This Sacred Council of the Church earnestly entreats pastors and all the faithful to spare no sacrifice in helping Catholic schools fulfill their function in a continually more perfect way, and especially in caring for the needs of those who are poor in the goods of this world or who are deprived of the assistance and affection of a family or who are strangers to the gift of Faith. Since the NFER admission test on offer by Catholic Grammar schools comprises a verbal, non-verbal and mathematics paper and cannot be prepared for in primary schools under the revised curriculum it follows that any tuition, coaching or practice for the Catholic test will disadvantage the poor. Any preparation must take place outside of school time. Gravissimum Educationis is about Christian education but only for Catholic Christians it seems. Reading it, if they have been taught to read, must make the poor child wonder if and when they will ever get an equality of opportunity from the Education Minister and Department of Education in Northern Ireland. In addition it is the task of the state to see to it that all citizens are able to come to a suitable share in culture and are properly prepared to exercise their civic duties and rights. Therefore the state must protect the right of children to an adequate school education, check on the ability of teachers and the excellence of their training, look after the health of the pupils and in general, promote the whole school project. But it must always keep in mind the principle of subsidiarity so that there is no kind of school monopoly, for this is opposed to the native rights of the human person, to the development and spread of culture, to the peaceful association of citizens and to the pluralism that exists today in ever so many societies. On the eve of 2009 it is opportune to reflect on the legacy of ending the 11-plus in Northern Ireland. The “unregulated” system has left a vacuum of uncertainty for parents and children in primary schools. One group of grammar schools are offering a privitased transfer test similar to the most recent form of 11-plus testing. The Catholic sector, unwilling to join their Christian fellows in the Voluntary and Controlled grammar schools, have broken away and will offer a retrograde “intelligence test” impossible to teach for using the current revised curriculum. The Apartheid system facing parents in 2009 will result in further and formal segregation of schooling on a denominational basis. There will be no parity between the tests and parents living in Belfast will struggle to decide which test to enter their child for. The practical difficulties alone only serve to highlight the ineptitude of those charged with delivering education services. The peculiar moral and ethical juxtaposition of the Catholic Church’s position over a retrograde test for admission is best highlighted in the following passage. It should be remembered that the Church supports the revised curriculum. As for the DUP; their support for the ESA and the litany of failures delivered by CCEA is only matched by their facile reversal of the St Andrew’s Agreement promises on academic selection and grammar schools. In the specifically educational field, the scope of educational functions has broadened, becoming more complex, more specialized. The sciences of education, which concentrated in the past on the study of the child and teacher-training, have been widened to include the various stages of life, and the different spheres and situations beyond the school. New requirements have given force to the demand for new contents, new capabilities and new educational models besides those followed traditionally. Thus education and schooling become particularly difficult today. Such an outlook calls for courageous renewal on the part of the Catholic school. The precious heritage of the experience gained over the centuries reveals its vitality precisely in the capacity for prudent innovation. And so, now as in the past, the Catholic school must be able to speak for itself effectively and convincingly. The Catholic school, therefore, undertakes a cordial and constructive dialogue with states and civil authorities. Such dialogue and collaboration must be based on mutual respect, on the reciprocal recognition of each other’s role and on a common service to mankind. To achieve this end, the Catholic school willingly occupies its place within the school system of the different countries and in the legislation of the individual states, when the latter respect the fundamental rights of the human person, starting with respect for life and religious freedom. A correct relationship between state and school, not only a Catholic school, is based not so much on institutional relations as on the right of each person to receive a suitable education of their free choice. This right is acknowledged according to the principle of subsidiarity. (18) For “The public authority, therefore, whose duty it is to protect and defend the liberty of the citizens, is bound according to the principle of distributive justice to ensure that public subsidies are so allocated that parents are truly free to select schools for their children in accordance with their conscience“.